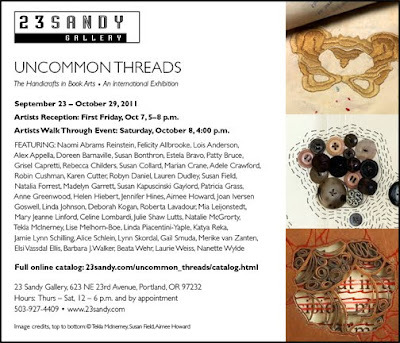 Uncommon Threads: Handicrafts in Book Arts opens at 23 Sandy Gallery in Portland, OR on September 23 and runs through October 29. There is an Artists Reception on Friday, October 7 from 5-8 pm and an Artist Walk Through Event on Saturday, October 8 at 4 pm. The gallery hours are Thursday through Saturday from 12-6 pm and by appointment. You can view the catalog online as well as purchase a printed copy. And read Laura's description of the jurying process for the show, Behind the Scenes of Jurying an Exhibition: An amazing week with Uncommon Threads, on the blog. I have one piece in the exhibit—Spirit Book #49: Creative Generosity.